From sunrise, to sunset and verso to sunrise again at Daytona Beach, Florida, with nothing but a Rolex to triumph in. So there are watch trips. And, then there are watch trips. And one of the most legendary - that a watch geek like myself absolutely dreams of – is the twice-around-the-clock marathon of the motorsports Rolex 24 At Daytona run on a 3.56-mile road course. Let’s preface all of this with the simple fact that I am not only a watch devotee, but also a motorsports fanatic. And specifically my fondness for the beauty of endurance sports car racing. Something about that vehement noise, accompanied by the fragrance of burning rubber all under usually the sunniest skies, sets me ablaze. For anyone who prefers ball sports, now you have a moment to reconsider. Endurance racing is exactly what it sounds like – racing for an extended period of time. In this case, a full 24 hours. Stoic. And fast. So excuse me whilst I get extremely overly excited about cars for a moment. Think Porsche 911 (who holds the most overall victories of any manufacturer here), Corvette, Ferrari, Lamborghini, BMW Coupe, Nissan, Cadillac, Mercedes, Acura and more. Sports car racing is a category of motorsports in which drivers pilot highly modified, yet easily identifiable, street cars. But then there are also open-wheel or prototype racing class feature vehicles that look more like spaceships than cars. It is a near death match of sorts, right here in Florida. In short, sports car racing seems somewhat attainable by gentleman drivers, which I most certainly aspire to be when I grow up - both a gentleman and a sport car racer. But the realities of endurance racing a sports car like yours truly, for 24 hours straight, is certainly quite a bit harder than it might seem. They call it the ultimate workout for a reason, right? At the Rolex 24, four classes of sports car and prototype series vehicles compete for both class and overall wins – sharing the track at the same time with considerably varied performance specifications. Thus ultimately results in a lot of passing of cars, and a lot of excitement for spectators already up on their feet. So there is high drama for absolutely everyone. Furthermore, the Rolex 24 is very much North America’s premier endurance event, and is the American answer to the 24 hours of LeMans, France. The Daytona International Speedway is the backdrop for the Rolex 24 – a storied racing circuit (part of a 500-acre motorsports complex) primarily known for NASCAR, but rich in history for motorsports of all types. The 24 hours event has been running for 57 years, with Rolex being the title partner since 1992. And yes, this event was the original inspiration for the storied Cosmograph Daytona. A watch that allows drivers to measure elapsed time and read average speeds on its trademark tachymetric bezel. A watch that even the great Paul Newman approves of. Battling through this fateful night in all manner of weather (and this year with extra torrential rains to boot), the Rolex 24 is an epic challenge to the endurance of both human and machine. Plus the bragging rights go beyond just a small podium photo opportunity alongside a shiny trophy in hand - the winning drivers walk away with commemorative Rolex Daytona chronographs. Arguably the only Daytonas truly worthy of the legendary name. If you haven’t won the Rolex 24 you probably won’t be wearing one of the highly coveted winner’s timepieces, with that engraving on the back. But even a standard production Daytona is somewhat hard to come by. But that doesn’t mean you shouldn’t get on the forever waiting list, or scoop up a vintage model at your earliest opportunity. They are, after all, one of the most iconic chronographs of all time, and wearing one from any era while at the track is just…so right. This was the the ultimate weekend of weekends, the Game of Thrones weekend of weekends. I could have desired nothing more. A few sunny Florida days with the title sponsor was pure fantasy – all access anything and everything, hot laps with five time overall champion Scott Pruett. And then that secret insider look at how Rolex’s commitment to supporting motorsports manifests itself at one of the year’s most important endurance events. And I mentioned the speed part, right? To make this weekend a reality, here are some ways of putting it all together. Shores Resort Daytona Beach is four inches from the sands of the beachfront, needless to say, that is perfect for pre and post race hours. Azure is The Shores’ in-house open-air restaurant, Azure Oceanfront American Kitchen, perfect for eating too much seafood. Martini’s is the health option, without the scream of high horsepower engines, after a long day at the track gorging on hot dogs and Bavarian pretzels. Just steer clear of the Skittles Martini, or the screeching in your head will be there to stay. Founded in 2006 by five-time Rolex 24 winning driver Scott Pruett and his wife Judy, these award winning Pruett Vineyards Syrah wines are ingestible proof that excellence comes with the territory when your last name is Pruett. Produced on his home estate in the Northern Sierra Foothills of California, Pruett Vineyards small batch bottlings are amongst the highest-ranked Syrahs in the country, and are of course served at the legendary race track Scott affectionately refers to as “his house”. ISC Archives And Research Center is where to get an insider’s geek peek if the hyper-commercialized side of motorsports isn’t for you. Be prepared to pull some strings and ask some favors to get access, but once you’re inside the subtly-advertised and otherwise miss-able building adjacent to the Speedway grounds, you’ll find yourself in a racing historian’s mecca. Trophies, advertising and vintage paraphernalia adorn the walls (and floors, and ceiling), a library with thousands of automotive titles, and a vault keeping millions of original negatives, film reels, and magazine titles documenting the history of America’s obsession with speed await. Ask for Director Herb Branham, you’ll be glad you did. Motorsports Hall Of Fame Museum has innumerable artifacts and racing vehicles making up their collection – included among them is Sir Malcolm Campbell’s 1935 Bluebird V land speed record car. The Pits. No trip to an endurance racing event is complete without a pit walk. Viewing the action from the grandstand alone will not properly convey the huge amount of effort drivers and their teams put forth in logistics, communication, and data monitoring. The energy and excitement is palpable both before and during the racing. And unlike other sporting events, motor racing is inherently open and accessible, allowing attendees the opportunity to get up close and personal to the action – just don’t get in their way. They say you can’t truly appreciate a race track until you drive it. And they are right. While driving the legendary course on race weekend is strictly a professionals-only thing, that doesn’t have to stop you from strapping into the passenger seat with an accredited racing driver and hitting the three and a half mile course at speeds up to 160 miles per hour on the track’s famous banked corners in high-performance street cars. If you know the right people, you might even get to ride shotgun with 2019’s Grand Marshall, Scott Pruett, that’s why they call it the Hot Laps. Rolex 24 Lounge, your home away from home all weekend. 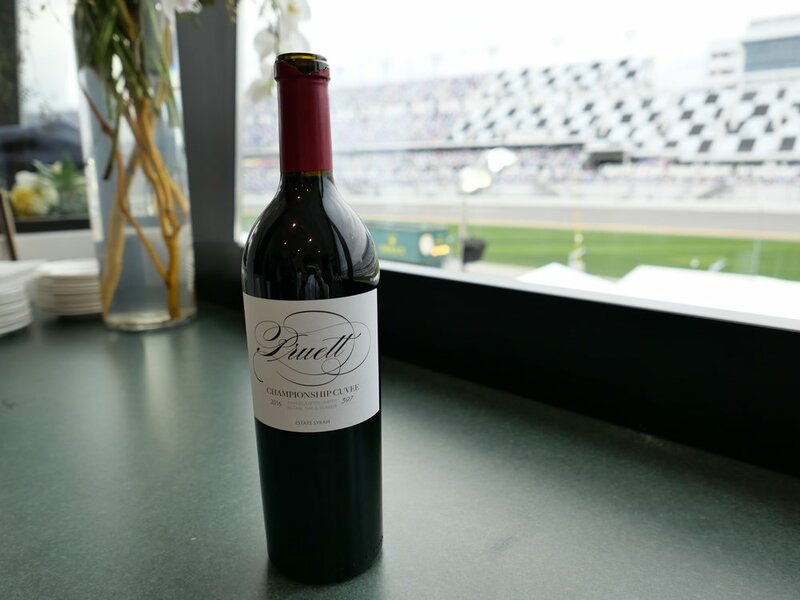 Daytona 500 Club is where to rub elbows with motorsports royalty.